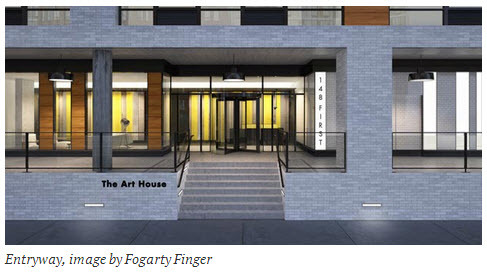 A tipster submitted renderings of Jersey City’s Art House, located at 148 First Street, in the Powerhouse Arts District. 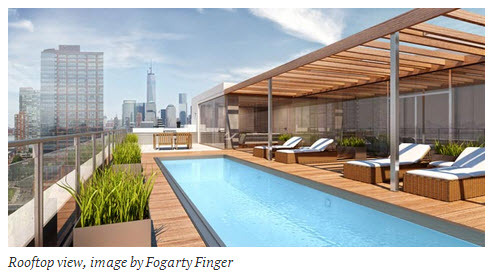 The Shuster Group is developing, and Fogarty Finger is the project’s architect. 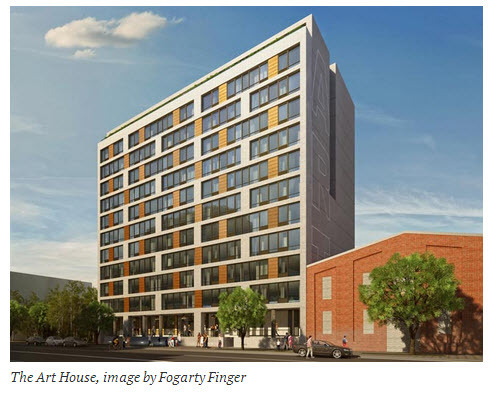 The Art House will have 119 units, and stands twelve stories tall; the building’s appearance is relatively simple, and the white-brick facade is interspersed with wood paneling. The envelope is flush with the street-wall, and the project is a positive infill development for a neighborhood that is rapidly growing. While Jersey City’s waterfront has been the primary beneficiary of the ongoing development boom, the Powerhouse Arts District also presents a major opportunity for growth. 148 First Street is one block south of the Hudson Exchange site, which will further improve the neighborhood, transforming acres of parking lots into a vibrant node. Completion of The Art House is imminent, and leasing is now underway; the rental project is expected to open this September.